Active in multiple industries and markets, Perkins is renowned across the world for its engines. Olivia Midgley toured the firm’s manufacturing plant in Curitiba, Brazil, to find out more about the international operation. 130 people work at Perkins' 5,000 sq.m plant in Curitiba, Brazil. Although renowned in the UK for its facility in Peterborough, opened in 1932, Perkins runs manufacturing facilities in Brazil, India and China. Perkins’ global positioning has helped it stay ahead of its game. Not only is the engine manufacturer able to source parts more cost-effectively thanks to its geographical spread, but its wide customer base means it can distribute engines quickly and efficiently across the world. Now a subsidiary of Caterpillar, its engines serve about 1,000 customers across the construction, material handling, power generation and industrial sectors as well as agriculture. Farmers Guardian news and business editor and British Guild of Agricultural Journalists (BGAJ) member Olivia Midgley visited Brazil thanks to the Perkins Global Innovation Scholarship, which enables journalists and communicators to see farm innovation and technology in distant countries. Rodrigo Chibor, general manager at Perkins Curitiba. The plant in Curitiba, the capital of the southern Brazilian state Paraná, manufactures about 81,000 of the 900,000 engines the group produces each year. Perkins’ biggest agricultural customers are Massey Ferguson - the second biggest manufacturer in Brazil – and John Deere, whose plants are situated a few yards from the Perkins factory. 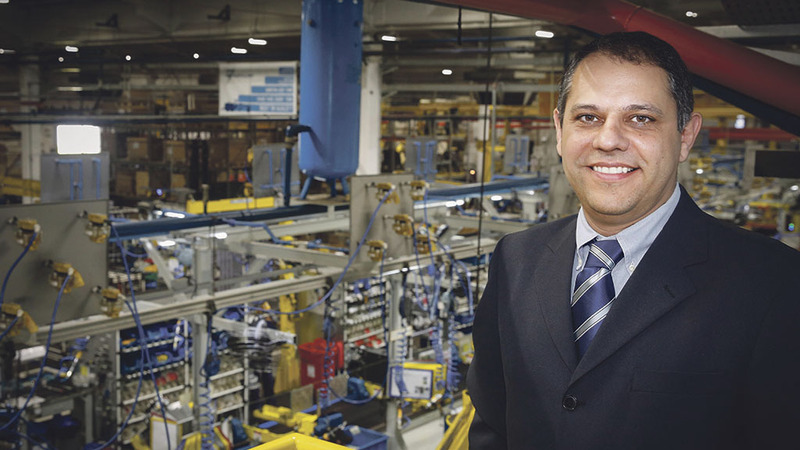 “Our manufacturing plants are strategically placed which means we are able to serve our customers efficiently,” says Rodrigo Chibor, general manager at Perkins Curitiba. Brazil accounts for about 7 per cent of global agricultural exports and is the world’s third-largest exporter of agricultural products behind the European Union and the United States. As the second-largest producer of soybean in the world, its largest export is soybean products, followed by sugar and ethanol, meat, coffee and cereals. Its farmers’ hunger for greater efficiency has helped it become one of the leaders in global agriculture and experts believe it is well placed to increase production further as the world’s population increases. Mr Chibor adds: “Brazil is gearing up to serve a population of 9.5 billion people in 2050. While farmers in other big producing countries such as India and North America can often be hampered by the weather, Brazil enjoys a good climate. Mr Chibor says ‘futuristic’ projections of what farming in Brazil could look like, ‘are closer than we think’, with some operations already using multiple machines to deploy precision techniques over just a few hectares. Mr Chibor says this enables Perkins to source raw materials at the most competitive prices and ship them to the factory as cost-effectively as possible. “We are of course operating in a global market so we are affected by world events,” says Mr Chibor. “We receive parts from the USA twice a week so when Hurricane Matthew hit in late September, we had to look at how that might affect the business. Luckily it did not. “Of course the nature of our business means that sometimes we are asked to fulfil orders at very short notice. Perkins manufactures most of the engines in the continent where the majority are consumed. The benefits of this are lead-time reduction and supply flexibility, protection against significant currency fluctuations, regional parts inventory cost reduction and speed of response. “We have got a very flexible production process which means we are able to manufacture a range of engines, with many bespoke to individual customer needs,” he adds. “We are capable of manufacturing 32 engines on the main assembly line – three, four and six cylinder – which is quite unique. Its global positioning means Perkins is able to provide a ‘local’ Regional Applications Engineering Support service, with more than 1,700 service outlets available throughout Europe, and more than 1,200 in North America, plus 24-hour support from parts distribution centres. “It is logical that suppliers know a lot about their components so they are best placed to deal with it if there is a problem and find a solution,” says Mr Chibor. “We call it ‘global presence with local support’. “Some tractors will be operating for 18 hours a day so it is essential our customers receive the support they need. People are relying on our engines. It is therefore essential we make a product that is robust enough for the needs of the customer. The factory is capable of building an engine in eight hours, testing it and then shipping it to the customer the same day. “We want to be the first choice for parts and service wherever you are in the world,” adds Mr Chibor. 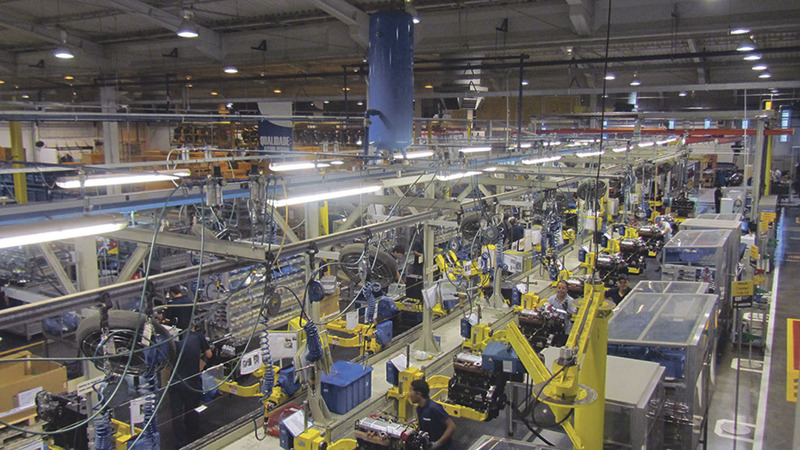 About 81,000 engines are produced at the Curitiba plant each year. “We have a large amount of stock components so we can meet customer needs. If we start in the morning the engine can be ready to ship for 4pm. It used to take three and a half days. Key to engines’ reliability is the polished production process. The 5,000 sq.m factory operates five days a week and each engine is carefully constructed. “The engine is like a heart,” says Mr Chibor. The more care you take in the first assembly process, the less likely you are to have a problem later down the line. It is all about reducing the risk to the end consumer. Engines built at the Curitiba plant include the 1100, 2500 and 2800 Series. More than 100,000 of the 1100 Series are built each year.